Larry Kirwan is the main man behind the band Black 47. I like that band a lot, and I like Kirwan. 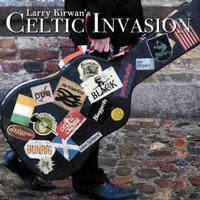 This CD contains a selection of Celtic music hand picked by Kirwan. It’s a great collection, although for my money some songs are better than others. Yes, I know that Saint Patrick’s Day is past, but there’s always next year. Besides that, you can listen to this all year round. Get out and get yourself a copy now. Acoustic guitar opens this one. It powers out to more of a rocker, but still with a melodic element from there. I love the vocal arrangement on this thing. You will find yourself singing, “Beware the weekend Irish” along with these guys. There’s a little pipes interlude later. The sounds that open this are definitely more purely Celtic. The cut works out to a rather punky rocker that’s got tons of energy. It’s another killer tune. This is classic Black 47. I have to say that I love everything this band does, so this is no exception. Larry Kirwan’s vocals are always perfect for the song and the mix of modern rock with classic sounds and real Celtic textures is perfect. This is my favorite tune here, but I expected that to be the case. This one is OK, but not really one of my favorites. The vocals on the early sections make me think of Tom Jones, and that’s not necessarily a good thing. There are some harder rocking moments later that work better in my opinion. This tune doesn’t really strike me as particularly Celtic, but it’s cool. It rocks out with a raw, nearly heavy metal sound. It’s a killer tune and one of my favorites of the set. I love some of the retro keyboard sounds and the jam that takes it later is awesome. I love the raw, roots rock kind of vibe to this thing. It definitely has a world music vibe. I love some of the acoustic guitar soloing on this. The rhythmic vibe that drives it is contagious. What a cool tune this is. This, now, is very energized, melodic Celtic music. It really is catchy and will you have feeling the need to get to your feet. This is another great tune. Starting almost more atmospheric, this moves out to more traditional Celtic music from there. Later, though, this instrumental shifts to a sound that feels like part progressive rock, part electronic music. Celtic music and punk energy have been married for a long time. This cut proves that the union is as strong as ever. This is another tune that’s designed to get you to your feet. It just plain rocks. I’m not really blown away by this one. It’s more traditional Celtic music. It’s melodic and has a lot of energy. It just doesn’t really grab me. Still, it’s pretty good, anyway. I love this track. Sure, it’s more melodic Celtic music, but it’s got a cool edge to it. There’s almost a hip hop vibe at times. That said, there’s no one going to think it’s hip hop. It’s definitely Celtic music. Where ever you see the influences land, though, this is a catchy tune that just plain works. It’s one of the highlights here. More of an acoustic based tune, this nonetheless really rocks. I like it a lot. I wouldn’t say it’s a pure highlight, but the pounding drums and stomping music certainly sells it. This is quite traditional Celtic music, particularly when the pipe enters.